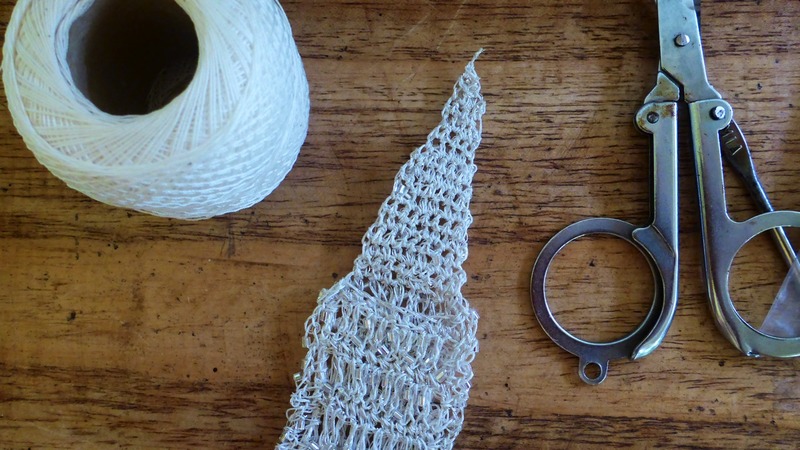 "A Simple Crocheted Amulet Bag" is a simple pattern to make a tiny basic bag shape with a pointed flap. Straps and fringes are added. 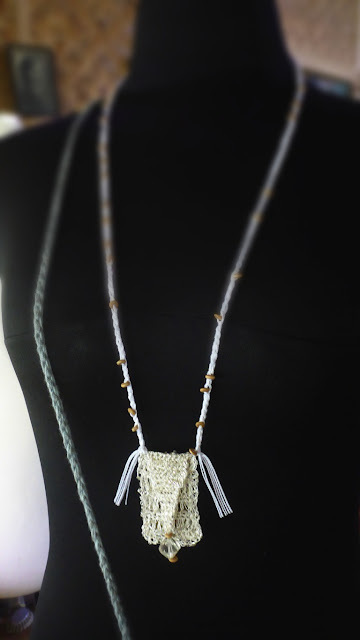 This Amulet Bag is intended to be worn as jewelry. 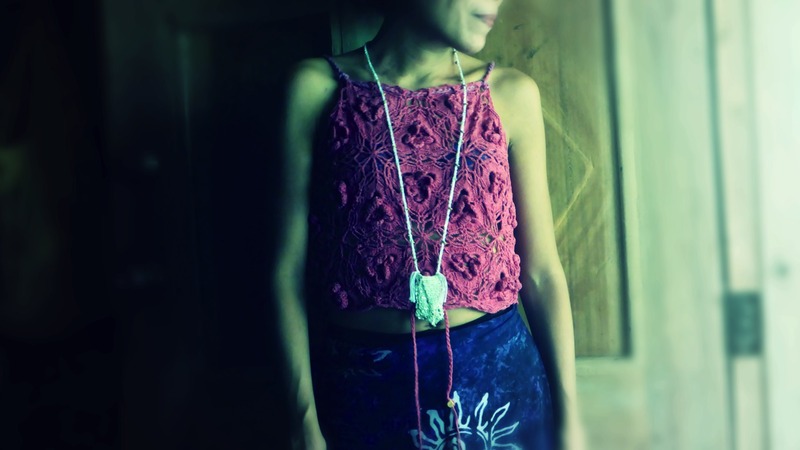 The crocheter is encouraged to experiment with different yarns and beads, different colour schemes. 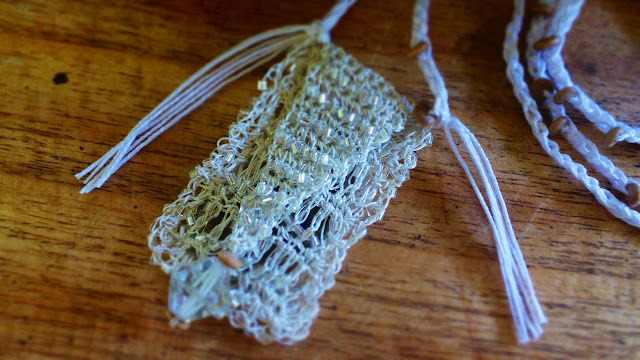 The crocheter must know some basic bead crocheting to make this Amulet Bag. 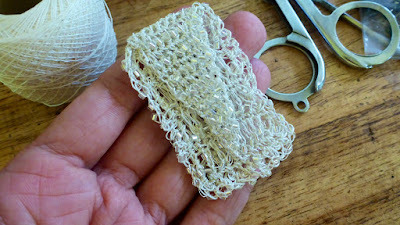 For this bag I used a combination of white crochet cotton thread size 60 and silver embroidery thread. For the strap and fringes I used a combination of white crochet cotton thread size 10 and size 8. You may use glitter thread, however, it may not be easy to thread the tiny beads. 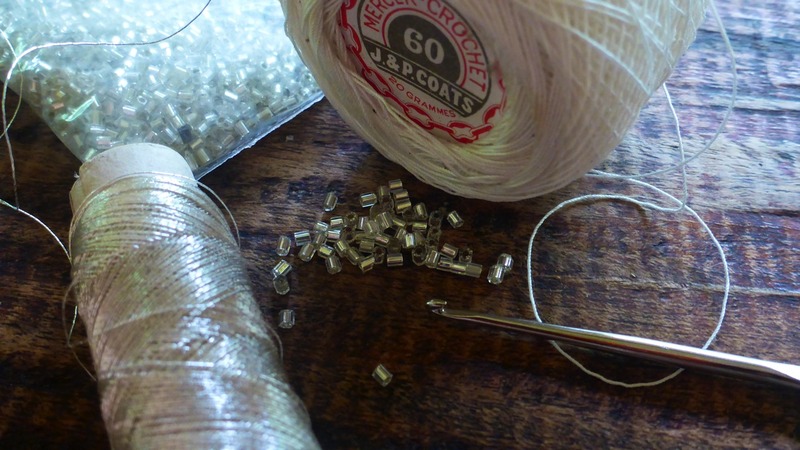 So consider the types of beads you are using when selecting a suitable thread or yarn. I used steel crochet hook size 1.24mm. 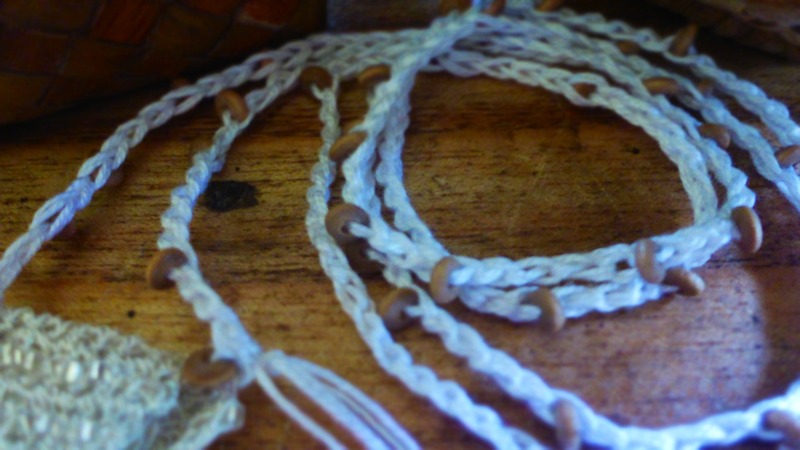 I also used a bead threader. This is a needle-like thing that is made of plastic or nylon material. A crochet friend gave this to me and I have found this to be a very useful tool for threading small beads. The beads I used as small glass beads and small wood discs, and one large glass bead. 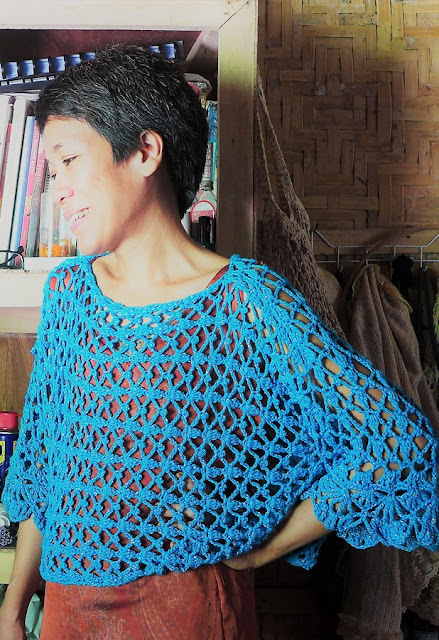 The bag body is crocheted in one piece, folded, then crocheted along the side seam, along the bottom, then the other side seam, then the flap is crocheted. 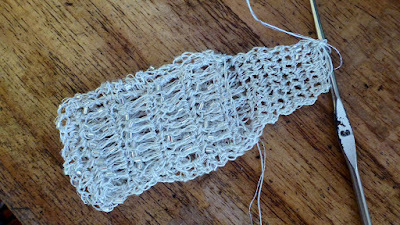 The strap is attached and crocheted separately. The amulet bag measures 2.25" tall and 1.25" wide, with the flap measuring 1.75" long. 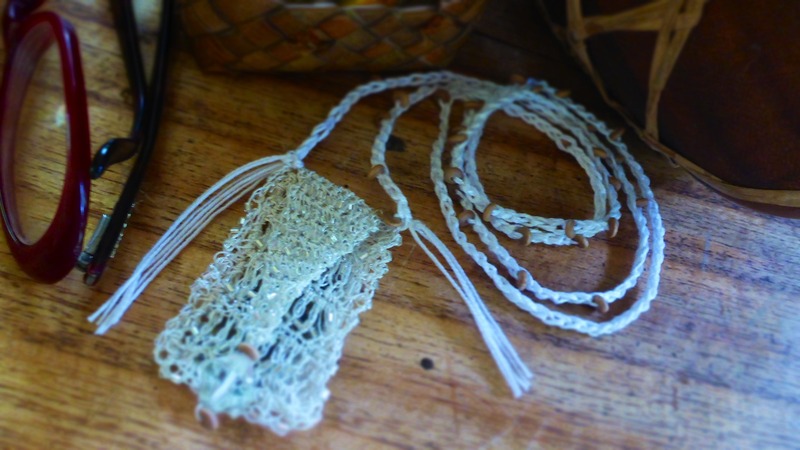 Amulet bags and the like have been around for centuries and they are getting quite popular in current times. For example are these amulet or medicine bags from Free People (photos below). 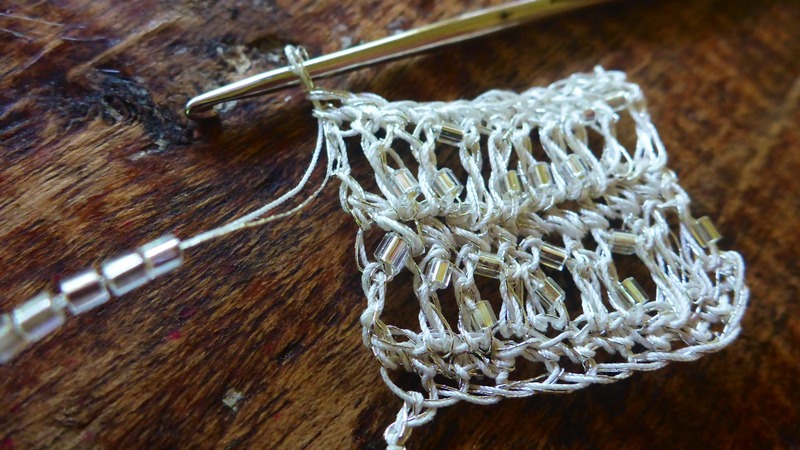 To make your own, feel free to modify this pattern and use other colours, beads and yarns. 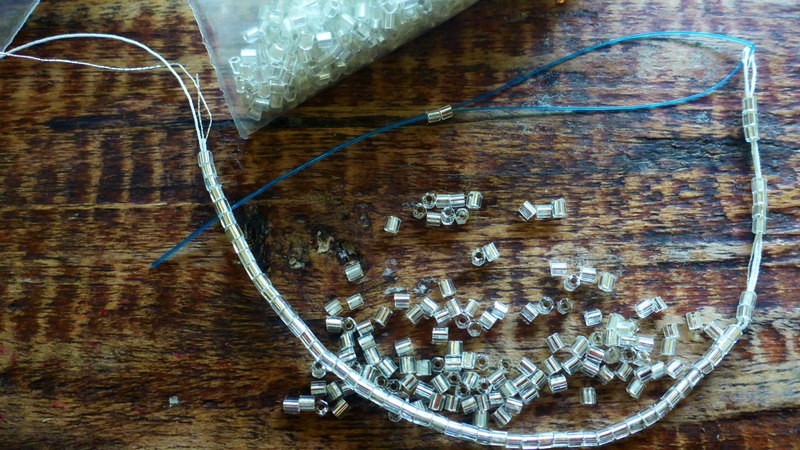 Using a collapsible or plastic bead threader, thread 150 glass beads onto the silver thread and cotton thread held together. Ch 11. Row 1: (Right Side) Sc in second ch fr hook, sc in each of next 9 ch. 10 ch made. Ch 3 (count as 1 dc), turn. Row 2: (Wrong Side) Slide bead, sk first sc, dc in next sc, *yo hook once, slide bead, insert hook in next dc, yo and pull loop through (3 dc made at this point including the 3-ch which counts as 1 dc); slide bead, dc in next dc; yo hook once, slide bead, insert hook in next dc, slide bead, yo and pull loop through; slide bead, dc in next dc; rep fr * in remaining sc (10 beaded dc made); ch 1, turn. (Note: All beads should be facing the back of the work). Row 3: Sc in each dc (10 sc made); Ch 3 (count as 1 dc), turn. Row 4-18: Rep rows 2-3, omitting ch 3 in the last row, instead, ch 1, turn. Sk first sc, sc in each of the next 8 sc, ch 1, turn, sc in each of next 8 sc, ch 1, turn, *slide bead, sc in next sc (bead sc made), rep fr * in all 8 sc; ch 1, turn, sc in each of the next 8 sc, ch 1, turn, sk first sc, bead sc in each of next 6 sc, ch 1, turn, sk first sc, sc in each of next 4 sc, ch 1, turn, sk first sc, bead sc in each of next 2 sc, ch 1, turn, sc together the two sc, ch 1, turn, bead sc in sc. Fasten off. Using needle and thread, sew the large glass bead and two wooden discs to tip of flap. See photo for detail. Thread 25 wooden discs onto the white crochet thread size 8 and size 10 held together. Leaving 3" tail, join with sc to side of bag, slide disc, ch 3, slide disc, ch 5, slide disc, ch 3, slide disc, ch 7, slide disc, ch 5, slide disc ch 9, slide disc, ch 3, slide disc, ch 12, slide disc, ch 5, slide disc, ch 7, slide disc, ch 15, etc. Make strap 30" long then join with sc to other side of bag. Cut leaving 3" tail. Using needle join more thread to end of the strap to make a fringe. Trim the fringe with sharp scissors.